Two Miracles in Charleston A stunning demonstration of Christian faith helps resolve a bitter decades-long argument. I know there’s a lot going on, but I think we witnessed two miracles this week, and public miracles are pretty rare and must be named. These two especially should be noted and remembered because they suggest a way out of the ongoing morass. 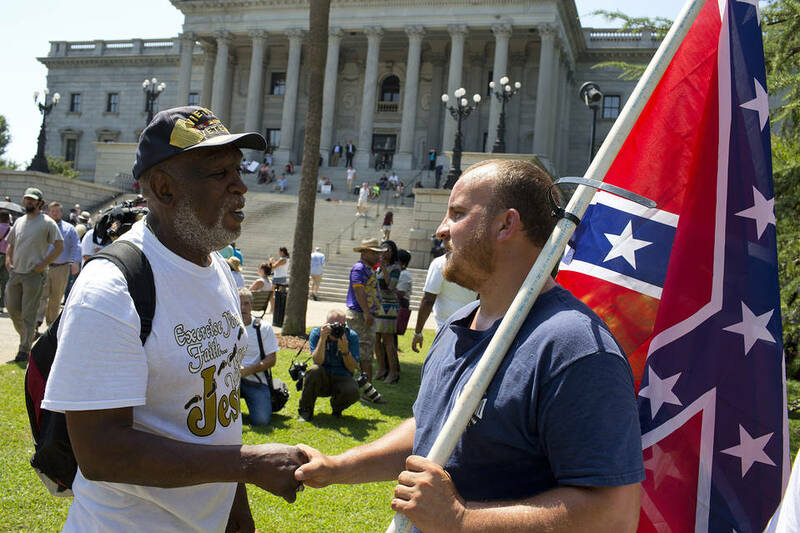 A rally at the South Carolina State House in Columbia calls for the confederate flags removal on June 23. Within days, something else wholly unexpected happened. A tough old knot became untied. Something people had been fighting about for a long time was suddenly about to be resolved. The murders at the church, and what was said by the relatives of the dead, prompted the rejection of the Confederate battle flag in gentle, kindly, heartfelt words. The tableau at the South Carolina Capitol surrounding Gov. Nikki Haley was itself moving—both parties, all colors, the Indian-American governor flanked by the African-American U.S. senator, Tim Scott. And that was that. Within 48 hours the governor of Alabama, Robert Bentley, ordered the flag removed from the statehouse grounds there, and Mississippi Sen. Roger Wicker said his state’s flag, which incorporates the Confederate design, should be altered. Govs. Nathan Deal of Georgia and Terry McAuliffe of Virginia said they’d do away with vanity license plates that include the banner. It hardly needs be said American politics doesn’t usually work like this. Our political culture tends to be mean-spirited, shouty, full of moral posing and pointed fingers. In this case, everyone seemed to be laying down arms. This was a miracle not of “justice” but of “mercy.” Justice can be argued about forever, but mercy is just what it is, as the people who spoke at the bail hearing know. It’s hard to imagine the Confederate battle flag is going to be given prominence on statehouse grounds in the future. Something big changed in this old argument, and it won’t change back. When I first watched the hearing, I hoped the mourning people of South Carolina would not have political debates forced on them while their throats were full of tears. But as Ms. Haley implied, they went forward on their own, as Southerners and South Carolinians, and made the decision while their throats were full of tears. This was the South talking to the South. And it was Christians talking to Christians about what Christianity is. That is exactly what I thought as I watched the hearing. The Nobel Peace Prize committee, if they know it, have some new nominees: the relatives of the dead who offered the mercy that relaxed the hands of those who’d been holding, too tight, to a flag. Everyone thinks progress depends on indignation, accusation, aggression, demonstration, marching. But we just saw anger lose to love. It’s a huge moment.